Background: Temporary crown and bridge materials have to fulfill a couple of important functions within the timeframe between tooth preparations until luting of the definitive restoration. The aim of the current study was to evaluate the color stability and fracture resistance of two fiber-reinforced provisional fixed partial denture (FPD) materials. 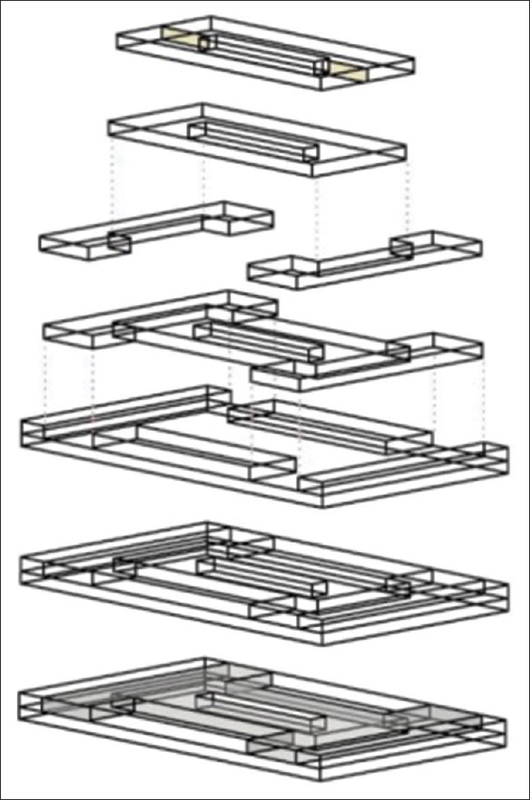 Materials and Methods: In this in vitro study Using a plexiglass mold, 96 bar-shaped specimens (4 mm × 2 mm × 20 mm) were fabricated and divided into four groups (n = 24): nonreinforced composite (NRC) resin, glass fiber-reinforced composite resin (RC), nonreinforced polymethylmethacrylate (PMMA), and glass fiber-reinforced PMMA. Values of CIEL*a*b* were recorded for all the samples. Then, the samples were immersed in coffee, chlorhexidine mouthrinse, and distilled water. After 1 day and 1 and 4 weeks, CIEL*a*b* values were recorded again and color differences (ΔE) were calculated. All the specimens immersed in distilled water were then subjected to force to measure their fracture resistance. Data were analyzed with one-way ANOVA, honestly significant difference Tukey tests, and paired t-test (α = 0.05). Results: The NRC group, immersed in coffee for 1 month, exhibited the highest ΔE (17.1 ± 0.69) and the lowest ΔE belonged to the RC group immersed in water for 1 day. The RC group, immersed in water, exhibited the highest fracture resistance. Conclusion: Coffee is considered as one of the most important factors affecting color changes in provisional FPDs, either in composite resins or in PMMAs. Fracture resistance of both composite resin and PMMA FPDs revealed no significant differences between the groups; however, there were significant differences between the nonreinforced and fiber-reinforced FPDs in both groups. Fixed partial dentures (FPDs) should meet the biologic and esthetic needs in a manner similar to mechanical needs which include resistance to functional forces, resistance to forces that dislodge the prosthesis, and preservation of the status of the abutment. Materials that are currently used for the fabrication of temporary prostheses include self-cured and dual-cured resins such as polymethylmethacrylate (PMMA), polyethylmethacrylate, polyvinyl (ethylmethacrylate), bisphenol A-glycidyl methacrylate resins, bis-acryl composite resins, and light-cured urethane-dimethacrylate resins., These materials should exhibit adequate strength to withstand masticatory forces, especially in long-span FPDs; FPDs that are administered for a long term and in patients with parafunctional habits. The materials used to fabricate temporary restorations should not undergo color changes, which is especially important in the case of long-term treatments. Therefore, the color stability might be an important criterion for selecting a material for temporary prostheses, especially in esthetic areas., Discoloration takes place for various reasons and might be due to intrinsic or extrinsic staining during the treatment process.,, Partial polymerization, water sorption, chemical reactivity, and softening of the surface of temporary prosthesis, diet,, and oral hygiene might affect discoloration. In a study by Koksal and Dikbas, coffee was reported to be the most important chromogenic agent for acrylic dentures. The small particles of coffee might precipitate in the cavities on the surface of the acrylic resin which have been created due to polymerization shrinkage of prosthetic materials. Tannin and other polyphenols found in coffee have high solubility in water, resulting in discoloration. These important ingredients can penetrate deep into the prosthetic material through both absorption and adsorption. The discoloring potential of the agent increases with an increase in its molecular weight. Therefore, the color of coffee is considered strong and stable. The staining mechanism of coffee in polymeric materials (polyethylene, polypropylene, polyester, and polyamides) is explained in two ways: the first explanation involves absorption of coffee pigments into the material and the second one involves an ionic interaction with amine groups. Glass and polyethylene fibers are extensively used not only for the improvement of the mechanical properties of resins but also due to their proper esthetic appearance, biocompatibility, and ease of use.,, Resin-modified glass fibers are considered successful new materials due to their proper adhesion to the polymer matrix, good esthetic appearance, and an increase in the strength of the resultant composite.,,, Temporary FPDs reinforced with resin-modified fibers exhibit higher fracture resistance compared to FPDs reinforced with nonresin-modified fibers. Statistically, reinforcing glass fibers with silane results in a significant increase in the flexural strength possibly attributed to the presence of silane-coupling agent that chemically bonds the inorganic glass fibers to the organic resin matrix, making these two materials homogeneous and finally resulting in the creation of a PMMA or a strong composite. The ability of glass fiber to delay or prevent crack propagation is another reason for the importance of this material for increasing fracture resistance. One of the aims of the present in vitro study was to compare the color stability of two materials used for the fabrication of FPDs, including a self-cured composite resin and one type of self-cured PMMA and their reinforced types with resin-modified glass fibers in different coloring solutions and time intervals. Another aim of the present study was to compare the fracture resistance of all the materials mentioned above without the effect of the solutions above. The null hypotheses tested in the present study were the type of the material, and incorporation of glass fibers does not affect discoloration and fracture resistance of the samples. Glass fiber-reinforced PMMA (RA) (Tempron, GC Corporation, Tokyo, Japan). The glass fibers used in the present study (Interlig, Angelus Dental Solutions, Londrina, Brazil) were resin-modified, measuring 2 mm in width and 0.2 mm in thickness. A plexiglass mold was used to prepare the samples that measured 4 mm × 2 mm × 20 mm [Figure 1]. The mold measured 40 mm × 65 mm and consisted of nine segments. To fabricate NRC group samples, first, the whole mold was filled with the material by injection gun and mixing tip. Based on manufacturer's instructions, the material was allowed to set in 4 min. To fabricate samples in the RC group, first, half of the mold was filled with the material by injection; then, a piece of glass fiber, measuring 16 mm in length and 2 mm in width, was placed on it, and finally, the other half of the mold was filled with composite by injection. Again, the samples were allowed to set completely for 4 min. To fabricate samples for the NRA group, based on manufacturer's instructions, first, 0.5 mL of the liquid was transferred into the mixing container and 1.0 g of the powder was added to it step by step. The mixture was mixed for 20‒30 s and then transferred into the mold. After 3 min and before complete setting, the sample was retrieved from the mold and immersed in 50°C water and retrieved several times to minimize polymerization shrinkage and the remaining unreacted monomer. To prepare samples for the RA group, the mixture was prepared same as NRA group and then transferred into the mold in a manner to fill half of the mold. Then, a piece of glass fiber, measuring 16 mm in length and 2 mm in width, was placed on it, and finally, the other half of the mold was filled with the remaining part of the material. After 3 min and before complete setting, the sample was retrieved from the mold and was immersed in 50°C water and retrieved several times to minimize polymerization shrinkage and the residual unreacted monomer. The glass fiber was placed in the reinforced samples in a manner to be 2 mm away from the ends and 1 mm from the sides of the samples. Finally, all the samples were polished, and it was made sure that there were no bubbles or cracks in the samples. Inclusion criteria consisted of the absence of cracks in the samples and placement of the fiber at the center of the samples. Exclusion criteria consisted of cracking of the samples during discoloration tests. A*b*: These indicate the chromic characteristics of a color. The parameter a* indicates the red-violet (a* more positive)/blue-green (a* more negative) axes of a color and the parameter b* indicates yellow (b* more positive)/violet/blue (b* more negative) axes of a color. A shade pilot spectrophotometer (DeguDent, Hanau, Germany) was used in the present study to determine color changes of the samples. Before determining L*a*b* values for each sample, the device was calibrated based on manufacturer's instructions. To increase the accuracy of the color scanning process of the samples by the device, a model was fabricated [Figure 2], which completely matched with the spectrophotometer, and the samples could be placed at the center of the model. Figure 2: The model was matched with the spectrophotometer for placing the samples at its center. ΔE > 3.5: Not acceptable. In the present study, ΔE of the NRC group in distilled water was 1.63, which is in the “good” category. After 4 weeks and analysis of color charges, all the samples that were immersed in distilled water were subjected to force for the evaluation of fracture resistance. D = Thickness of specimens. A static universal testing machine (Series LFM-L, walter + baiag, Löhningen, Switzerland) was used to determine the flexural strength. Force applied at the center of the samples at a crosshead speed of 1 mm/min and force application ended immediately after specimen fracture. The force was presented in Newton by the machine, which was converted into MPa using the formula above. Data were analyzed with one-way ANOVA, honestly significant difference Tukey tests, and paired t-test (α = 0.05). Considering the significant reciprocal effects between the type of material, the type of the solution, and different time intervals, one-way ANOVA was used to compare color changes in different groups. The results of post hoc Tukey tests showed significant changes in ΔE between the 12 study groups at 1-day, 1-week, and 4-week time intervals [Table 1]. The maximum color change was recorded in the NRC group samples immersed in coffee after 1 month (17.1 ± 0.69), and the least was recorded in the RC samples immersed in water at 1-day interval (1.26 ± 0.29). One-ways ANOVA revealed significant differences in two-by-two comparisons of the groups immersed in different solutions at different time intervals (P < 0.001); the results of post hoc Tukey tests for these two-by-two comparisons are presented in [Table 2]. 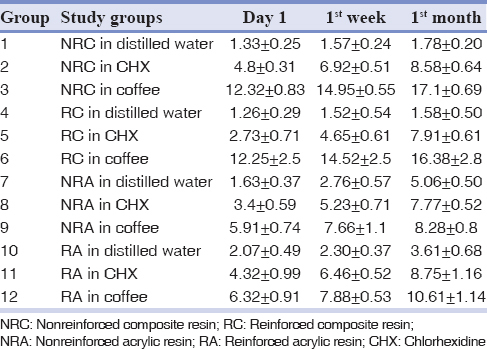 No significant differences were observed in ΔE between these groups: RC groups immersed in distilled water and CHX at 1-day interval (P = 0.09); NRA groups immersed in CHX and coffee at 1-month interval (P = 0.99); and RA groups immersed in CHX and coffee at 1-week interval (P = 0.15). There were significant differences in ΔE between the other groups immersed in different solutions at different time intervals. Paired t-test was used for intragroup comparison of ΔE at different time intervals, the results of which are presented in [Table 3]. In this context, in the RC group immersed in distilled water, there were no significant differences between 1-day and 1-week intervals (P = 0.27) and between 1-week and 1-month interval (P = 0.104). In addition, in the RA group immersed in distilled water, there were no significant differences between 1-day and 1-week intervals (P = 0.224). In other groups, there were significant differences in ΔE between 1-day, 1-week, and 1-month intervals (P < 0.001). [Table 4] summarizes the results of comparisons of ΔE between groups immersed in the same solution. In this context, there were significant differences between the NRC and NRA, NRC and RA, and RC and NRA groups immersed in distilled water at 4-week interval (P < 0.05). In relation to the groups immersed in CHX, there were significant differences in ΔE between the NRC and RC at both 1-day and 1-week intervals, NRC and NRA and RC and RA at 1-week interval, and NRC and NRA and RC and RA groups at 1-week interval (P < 0.05). 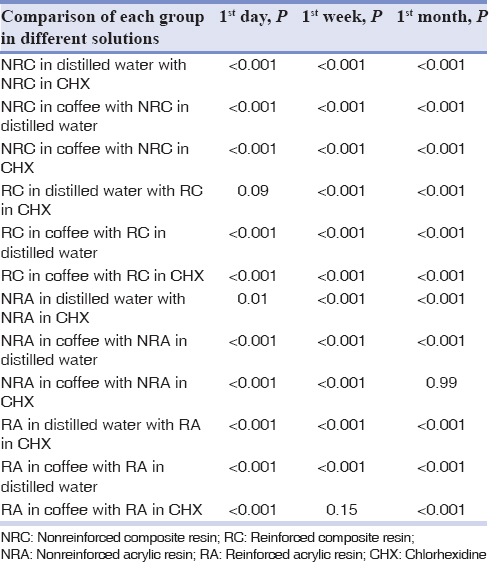 In relation to the groups immersed in coffee, there were no significant differences in ΔE between the NRA and RA groups at 1-day and 4-week intervals. In addition, there were no significant differences in ΔE between the NRC and RC groups at all the time intervals. There were significant differences in ΔE between the other groups at all the time intervals. [Table 5] presents the mean values of flexural strength in all the groups immersed in distilled water. Based on one-way ANOVA, there were significant differences in the means of flexural strength values between all the four groups (P < 0.001). In this context, the maximum and minimum flexural strength values were recorded in the RC and NRA groups, respectively. In addition, the effect of the use of glass fiber on increasing flexural strength in the RC group was significantly more evident compared to the NRC group and in the RA group compared to the NRA group. Based on the results of two-by-two comparisons of the groups with post hoc Tukey tests [Table 6], there was no significant difference in the mean flexural strength values between the NRA and NRC groups (P = 0.48). In addition, there were no significant differences in ΔE between the RA and RC groups (P = 0.104); however, the mean flexural strength values in the NRA and RC groups were significantly less than those in the RC and RA groups. In the present study, the null hypothesis stating that the type of the material and use of glass fiber had no effect on the color changes of specimens was rejected. In addition, the null hypothesis on the absence of the effect of incorporation of glass fiber on fracture resistance of the specimens was rejected. 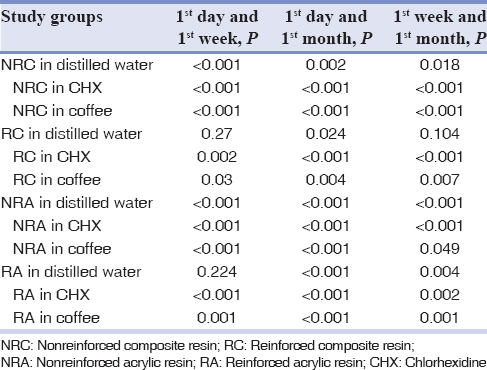 Based on the results of the present study, color changes of temporary composite resin materials in coffee and CHX were higher than those of PMMA temporary materials at all the time intervals. Similarly, based on the results of a study by Turgut et al., in which 140 disk-shaped samples of PMMA and composite resin were immersed in four different solutions (alcohol-containing mouthwash, CHX, benzydamine HCl, and benzydamine HCL and CHX), color changes in temporary composite resin materials were higher than those of temporary PMMA materials, which might be attributed to the homogeneous nature of temporary acrylic resin materials and the heterogeneous nature of temporary composite resin materials. Fine pigment particles can deposit on the surface porosities of composite resin base. Since glass is an amorphous material containing tetrahedral silica bonds that are positioned in a random network, this structure is different from the organic fibers such as polyethylene. According to various reports, nonorganic materials exhibit low water sorption and lower odds of color changes. However, in the present study, the difference in color changes between the glass fiber-reinforced samples and nonreinforced samples was not significant. In a study by Koumjian et al., seven different types of acrylic resin were used for the fabrication of temporary fixed dentures and their color changes were evaluated in vivo. All these materials exhibited some staining after 9 weeks. In addition, Rosentritt et al. showed that color changes of acrylic resin veneers were significantly less than those of composite resin after a period of 18 months. These results might be explained by high conversion rate and the presence of small amounts of materials such as dibenzoyl peroxide in PMMA teeth. The results of the present study are coincident with those of the studies above. In a study by Tuncdemir and Aykent on the staining of reinforced and NRC resins, both types exhibited staining. In the present study too, NRC and RC exhibited significant differences at both 1-day and 1-week intervals. In the present study, the highest fracture resistance was detected in the RC group. Based on a study by Kamble and Parkhedkar, polyethylene and glass fibers can increase the fracture resistance of composite resin and PMMA samples compared to nonreinforced samples that coincident with the results of the present study. Reinforcing different polymers with fibers results in an improvement in the mechanical properties of temporary restorations, including diametric strength, final tensile strength, and compressive strength, which might be possibly explained by the transfer of stresses from the poor polymer matrix to fibers with high flexural strength because reinforcing of the material with fiber results in better distribution of the forces applied within the material, resulting in a decrease in the transfer of stress and homogenization of the forces applied. In the present study too, the reason for a higher fracture resistance of the fiber-reinforced samples is the same. Comparison of the groups in the present study showed significant differences in the fracture resistance of prostheses with bases made of composite acrylic resin and PMMA. The present study showed that the flexural strength of composite acrylic resin base was higher than that of polymethyl acrylate resin. Based on the results of a study by Nejatidanesh et al. too, temporary restorations with composite acrylic resin exhibited higher flexural strength compared to methacrylate resins, coincident with the results of the present study. According to a study by Lang et al. too, the highest strength and lowest failure rate were observed in the composite group. The popularity of composite temporary restorations is increasing, partially leading to their marketing in a cartridge, which is not only comfortable but also leads to the extrusion of a correct and consistent composition, improving its mechanical and physical characteristics. In the present study too, the cartridge system of the composite material was used. One of the limitations of the present study was the morphologic differences between the samples and the crowns and bridges of natural teeth. It is recommended that in future studies samples be used that are similar to natural teeth. Based on a study by Poonacha et al., PMMA placed in an aqueous environment absorbs water. Water molecules penetrate into the PMMA matrix and fill the spaces between the polymer chains, finally disintegrating the affected polymer chains. The reason for a decrease in flexural strength of autopolymerized resins with a methacrylate base after immersion is the interference of water molecules with the increase in volume of polymer chains. Therefore, another limitation of the present study was the possible effect of storage of samples in 37°C distilled water for 4 weeks, which might have affected real fracture resistance of the samples. It is suggested that in future studies, this factor be taken into account. Consumption of coffee may be one of the etiologic factors of the temporary FPD staining made of composite resin and PMMA. In addition, administration of CHX mouthwash can be an etiologic factor for staining of these materials; however, its effect is not as important as that of coffee. The use of glass fibers cannot be considered an important factor for staining of these materials. There were no significant differences in the fracture resistance of these two reinforced and nonreinforced temporary FPD materials. However, in both materials, the use of fiberglass significantly improved fracture resistance compared to nonreinforced samples (P < 0.001). Many daily foods may change the color of the temporary FPDs made of composite resin and PMMA. Although the use of glass fibers can improve fracture resistance of the interim FPDs, it cannot be considered as an effective factor for staining of these materials. The authors of this manuscript declare that they have no conflicts of interest, real or perceived, financial or nonfinancial in this article. Haselton DR, Diaz-Arnold AM, Vargas MA. Flexural strength of provisional crown and fixed partial denture resins. J Prosthet Dent 2002;87:225-8. Gratton DG, Aquilino SA. Interim restorations. Dent Clin North Am 2004;48:vii, 487-97. Balkenhol M, Ferger P, Mautner MC, Wöstmann B. Provisional crown and fixed partial denture materials: Mechanical properties and degree of conversion. Dent Mater 2007;23:1574-83. Geerts GA, Overturf JH, Oberholzer TG. The effect of different reinforcements on the fracture toughness of materials for interim restorations. J Prosthet Dent 2008;99:461-7. Haselton DR, Diaz-Arnold AM, Dawson DV. Color stability of provisional crown and fixed partial denture resins. J Prosthet Dent 2005;93:70-5. Sham AS, Chu FC, Chai J, Chow TW. Color stability of provisional prosthodontic materials. J Prosthet Dent 2004;91:447-52. Moffa EB, Giampaolo ET, Izumida FE, Pavarina AC, Machado AL, Vergani CE, et al. Colour stability of relined dentures after chemical disinfection. A randomised clinical trial. J Dent 2011;39 Suppl 3:e65-71. Mundim FM, Garcia Lda F, Cruvinel DR, Lima FA, Bachmann L, Pires-de-Souza Fde C, et al. Color stability, opacity and degree of conversion of pre-heated composites. J Dent 2011;39 Suppl 1:e25-9. Pires-de-Souza Fde C, Garcia Lda F, Roselino Lde M, Naves LZ. Color stability of silorane-based composites submitted to accelerated artificial ageing – An in situ study. J Dent 2011;39 Suppl 1:e18-24. Ferracane JL, Moser JB, Greener EH. Ultraviolet light-induced yellowing of dental restorative resins. J Prosthet Dent 1985;54:483-7. Satou N, Khan AM, Matsumae I, Satou J, Shintani H.In vitro color change of composite-based resins. Dent Mater 1989;5:384-7. Pipko DJ, el-Sadeek M. An in vitro investigation of abrasion and staining of dental resins. J Dent Res 1972;51:689-705. Nordbö H, Attramadal A, Eriksen HM. Iron discoloration of acrylic resin exposed to chlorhexidine or tannic acid: A model study. J Prosthet Dent 1983;49:126-9. Gujjari AK, Bhatnagar VM, Basavaraju RM. Color stability and flexural strength of poly (methyl methacrylate) and bis-acrylic composite based provisional crown and bridge auto-polymerizing resins exposed to beverages and food dye: An in vitro study. Indian J Dent Res 2013;24:172-7. Asmussen E, Hansen EK. Surface discoloration of restorative resins in relation to surface softening and oral hygiene. Scand J Dent Res 1986;94:174-7. Koksal T, Dikbas I. Color stability of different denture teeth materials against various staining agents. Dent Mater J 2008;27:139-44. Koczorowski R, Linkowska-Swidzińska K, Gedrange T, Swidziński T. Analysis of colour stability of selected provisional prosthetic materials: An in vitro study. Biomed Tech (Berl) 2009;54:205-10. Koumjian JH, Nimmo A. Evaluation of fracture resistance of resins used for provisional restorations. J Prosthet Dent 1990;64:654-7. Vallittu PK. A review of methods used to reinforce polymethyl methacrylate resin. J Prosthodont 1995;4:183-7. Digholkar S, Madhav VN, Palaskar J. Evaluation of the flexural strength and microhardness of provisional crown and bridge materials fabricated by different methods. J Indian Prosthodont Soc 2016;16:328-34. Singh A, Garg S. Comparative evaluation of flexural strength of provisional crown and bridge materials-an invitro study. J Clin Diagn Res 2016;10:ZC72-7. Kanie T, Arikawa H, Fujii K, Ban S. Impact strength of acrylic denture base resin reinforced with woven glass fiber. Dent Mater J 2003;22:30-8. Meriç G, Dahl JE, Ruyter IE. Physicochemical evaluation of silica-glass fiber reinforced polymers for prosthodontic applications. Eur J Oral Sci 2005;113:258-64. Maruo Y, Nishigawa G, Irie M, Yoshihara K, Minagi S. Flexural properties of polyethylene, glass and carbon fiber-reinforced resin composites for prosthetic frameworks. Acta Odontol Scand 2015;73:581-7. Kanie T, Fujii K, Arikawa H, Inoue K. Flexural properties and impact strength of denture base polymer reinforced with woven glass fibers. Dent Mater 2000;16:150-8. Kolbeck C, Rosentritt M, Behr M, Lang R, Handel G.In vitro study of fracture strength and marginal adaptation of polyethylene-fibre-reinforced-composite versus glass-fibre-reinforced-composite fixed partial dentures. J Oral Rehabil 2002;29:668-74. Solnit GS. The effect of methyl methacrylate reinforcement with silane-treated and untreated glass fibers. J Prosthet Dent 1991;66:310-4. Vallittu PK. Acrylic resin-fiber composite – part II: The effect of polymerization shrinkage of polymethyl methacrylate applied to fiber roving on transverse strength. J Prosthet Dent 1994;71:613-7. Pfeiffer P, Grube L.In vitro resistance of reinforced interim fixed partial dentures. J Prosthet Dent 2003;89:170-4. Kamble VD, Parkhedkar RD.In vitro comparative evaluation of the effect of two different fiber reinforcements on the fracture toughness of provisional restorative resins. Indian J Dent Res 2012;23:140-4. Kamble VD, Parkhedkar RD, Mowade TK. The effect of different fiber reinforcements on flexural strength of provisional restorative resins: An in vitro study. J Adv Prosthodont 2012;4:1-6. Rosentritt M, Esch J, Behr M, Leibrock A, Handel G.In vivo color stability of resin composite veneers and acrylic resin teeth in removable partial dentures. Quintessence Int 1998;29:517-22. Turgut S, Bagis B, Ayaz EA, Ulusoy KU, Altintas SH, Korkmaz FM, et al. Discoloration of provisional restorations after oral rinses. Int J Med Sci 2013;10:1503-9. Tuncdemir AR, Aykent F. Effects of fibers on the color change and stability of resin composites after accelerated aging. Dent Mater J 2012;31:872-8. Koumjian JH, Firtell DN, Nimmo A. Color stability of provisional materials in vivo. J Prosthet Dent 1991;65:740-2. Caneppele TM, Silva IO, Borges AB, Borges AL, Torres CR. Influence of glass fiber reinforcement and resin viscosity on the fracture strength of adhesive partial fixed prosthetic dentures. Braz Dent Sci 2013;16:27-32. Nejatidanesh F, Momeni G, Savabi O. Flexural strength of interim resin materials for fixed prosthodontics. J Prosthodont 2009;18:507-11. Lang R, Rosentritt M, Behr M, Handel G. Fracture resistance of PMMA and resin matrix composite-based interim FPD materials. Int J Prosthodont 2003;16:381-4. Poonacha V, Poonacha S, Salagundi B, Rupesh PL, Raghavan R.In vitro comparison of flexural strength and elastic modulus of three provisional crown materials used in fixed prosthodontics. J Clin Exp Dent 2013;5:e212-7.